Peel 3 large white potatoes and grate them until you get hash looking potatoes. Mix with tofu and then cook in a skillet until cooked. Cook mushrooms with a sprinkle of water or vegetable broth. Add pink salt and pepper to taste. Mix parsley with cooked spinach. In a large glass bowl put the beets and carrots and mix. Add pink salt and pepper to taste. Layer the cooked potatoes on top. Then layer the parsley and spinach mixture. Put it in the fridge until it chills and sets. Put a plate over the top of the bowl and flip the bowl over. 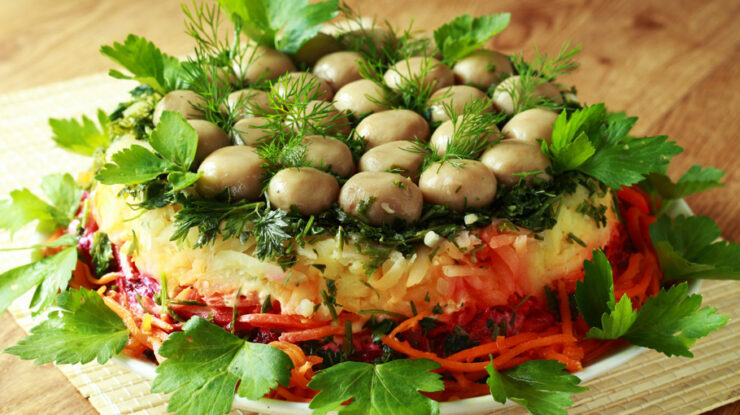 Once the pie is on the plate, put the mushrooms all over the top and garnish with dill.